Movie: "My Little Pony: The Movie"
After Equestria is attacked by the Storm King's army, Princess Twilight Sparkle and her friends set out on a quest to find help so they can take their kingdom back. Yes, we saw "My Little Pony: The Movie." No, we do not have kids, we are not Bronies, we have never seen the show, and we are definitely not in the target demographic. This animated feature is directed by Jayson Thiessen, who has been the supervising director on 104 "My Little Pony" television show episodes. While preparing for their friendship festival, Equestria is invaded by the army of the Storm King, voiced by Liev Schreiber. This army is led by an evil unicorn with a broken horn known as Tempest, voiced by Emily Blunt. Tempest has a plan to ensnare the four pony princesses and use their magic to give the Storm King absolute power. Now, the only princess to escape, Princess Twilight Sparkle, aka The Princess of Friendship, and her friends Rainbow Dash, Applejack, Fluttershy, Pinkie Pie, Rarity, and Spike the Dragon, set out on a quest in which they will use the powers of friendship to defeat Tempest and The Storm King. Yes, we just wrote that sentence, and yes, it sounds cloyingly super syrupy sweet. Luckily, it isn't so sweet that it's completely intolerable. 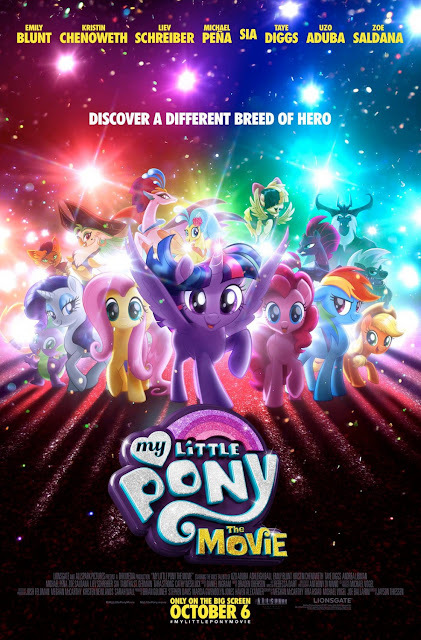 What "My Little Pony: The Movie" is is essentially an extended episode of the show with its own mini-encapsulated adventure. The movie is definitely made with the assumption that the audience knows the characters and their personalities. It doesn't really try to develop or introduce the primary cast, it drops into the story right away. When the film first starts, all the ponies are preparing for their friendship festival. We honestly got a little worried that the entire movie would be a combination of Rainbow Brite, "Trolls," the Care Bears, the Powerpuff Girls, and Lisa Frank vomiting their colors, cuteness, and general positivity all over the screen for 99 minutes. We can handle adorable, but this appeared to be too adorable. As soon as Tempest shows up, things actually start to get a little fun and somewhat interesting. The narrative itself lays out the basic and expected journey of self-discovery where the heroes must find their true power within themselves, only this time, they need to figure out that their greatest weapon is FRIENDSHIP! The voiceover work is quite good. We appreciate that the original voice cast from the television show has been brought back for the movie. There are a couple of pop culture references that are thrown in for the adults in the crowd to go along with the pink, sparkles, cupcakes, and charm. We doubt the targeted demographic little kids will understand the not so subtle "Pulp Fiction" reference. That being said, we have very little doubt children will love this movie, but whether or not adults will depend on their tolerance for saccharine-infested hug-a-thons like this. There are a bunch of songs here too, some of which work and manage to be pretty fun, and others that fail immediately, but overall the majority of them are at least endurable. Let's be honest here, there are far worse movies adults will and/or have had to sit through with their kids. "My Little Pony: The Movie" doesn't even make the top 10 worst movies for parents to deal with this year, so if you can spin that into a positive, have at it and enjoy the rainbow, pony, and song-filled time that is this film.